Comments: I love this album! I thought their first one was fantastic but they outdid themselves on this one! Every song is great! It's too difficult to say I have a favorite! Comments: With their self titled CD in 2007, The High Kings came on the scene with an epic sound and an honest rendering of Irish folk music in pure form. Their new release, Memory Lane, keeps the clean, honest renderings and exchanges the open, epic sound for a more intimate and personal approach. The sound has come in from the cathedrals and stone walled castles, and joined us in our living rooms and kitchens. 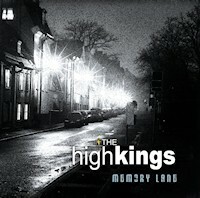 Want to write a review about The High Kings's Memory Lane album? Post your comments in this box to be displayed in our community forums and in our album database! Please make sure you are logged in before proceeding. Please login to write your comments about Memory Lane.